Fresh eyes on London: Does it snow in Australia? Does it snow in Australia? Actually yes but not very often. Then it is in the mountains in the south of Australia. 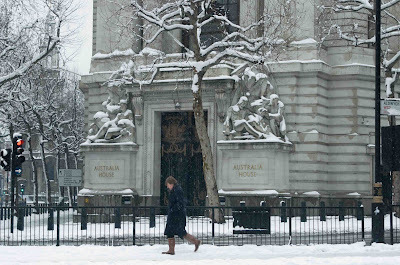 Now I am going to have an Australian tell me it snows somewhere else aren't I.
Australia House in London was officially opened in 1918 by King George V in front of a crowd of Aussies yelling out coo-ee. The daily express reported that the locals were rather taken aback by this strange antipodean ritual. However this was soon adapted to form part of the local football fans chant. Yesterday I saw on tv some amazing images of London covered with snow! So much snow! Just amazing. Actually it does snow in Australia right through winter but you're right about it being in the southern states. We actually get snow in places as far north as central New South Wales. Places like Katoomba are cold enough for light snow falls and that's only about an hour west of Sydney. We have many snowfields in the mountain ranges of Victoria and New South Wales, just south of Canberra, that are a huge attractions for skiers and snowboarders. Cheers. So jealous. While living in England, the most snow we ever had was a dusting. This snow is gorgeous. I was under the impression that London didn't get much snow! The statues look cool covered in snow! We got snowed on here in Hobart on New Years Day. It was at the top of Mount Wellington, but it was real snow. You can go skiing and boarding in NSW! In Thredbo and Perisher. Also in Victoria... It snows in quite a few places in Australia! Yes, it does snow in Australia. I happened to live in one of those highlands that have snowfall but not much. Infact my youngest girl was born on a snow day that I really dreamt about. Boy! wasn't it amazing when it happened in real? I enjoy your postings here. Will follow on you. Thanks for having me here. Hey can anyone see a piano there....?